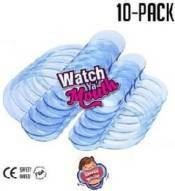 Enjoy Watch Ya� Mouth, The Original Mouthguard Party Game with this 10-pack of standard mouth pieces. Comes with 6 regular (great for most adult mouths) and 4 small (for pint-sized puckers). CE- and FDA-certified.